Traditional Retention and Recruitment Marketing split is finished – That’s quite a statement and one that perhaps many marketers will disagree with. However, I didn’t just make it up for fun; here is my thinking behind this: One of my first marketing roles back in 2005 was within the retention marketing team of an organisation. It was a membership organisation and I was responsible for selling training courses to the existing members – hence it was a retention activity. I used mainly direct mail, email marketing as well as some very basic search engine marketing in order to sell the courses. Other members of the marketing team were concentrating on recruitment marketing where they were trying to get new members for the organisation; they used similar marketing channels but perhaps also did a greater amount of face to face event marketing at graduation career fairs etc. The job of the recruitment team was to fill the bucket and the job of the retention team was to plug the holes in the bucket so that as little leakage as possible occurred. It was always considered in this organisation that recruitment marketing was the more expensive and the trickier of the 2 activities as you are trying to convert a relatively cold prospect whereas with retention marketing you were working with individuals already warm to the organisation. This made sense and the marketing budget was split accordingly with a heavy weighting towards recruitment marketing activities. In principal this is a logical split of marketing focus and I do think that prior to the internet this definitely made a lot of sense. With most businesses one of the most expensive activities is recruiting new customers; it is still not easy, however; due to the emergence of social media in particular there is a much greater blurring of the two disciplines and I would say a need to reassess the marketing activities and budget to reflect these changes. I believe that these changes are consistent across all business types and sizes. I do not have to add any statistics here regarding the growth of social media as a communication medium for both individuals and businesses – we all know that it has been massive and that it has fundamentally changed the way in which many people communicate. With this in mind here are some ideas around how you should be altering your activities and budgets to grow your business as quickly as possible in 2012 and beyond. 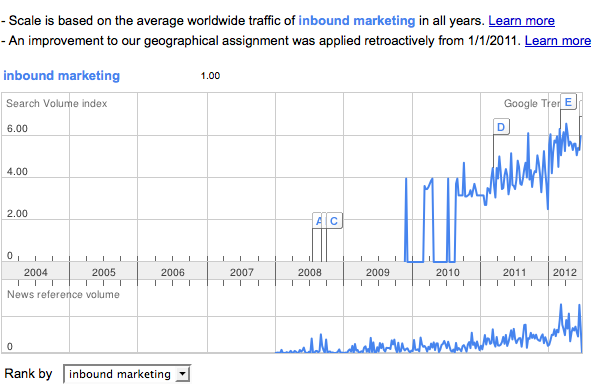 Why is there such a growth in interest in inbound marketing? Because it has been found that it is a much more effective and cheap way to recruit new customers. Hubspot stated in their 2012 “State of Inbound Marketing” research document that companies with a heavy focus on inbound marketing are recruiting new customers for 61% less than it costs companies who concentrate on more traditional outbound marketing techniques. Inbound marketing really revolves around forming relationships with your customers and potential customers that are strong enough that they come to you without too much of a push; rather they are drawn to you. This is key to my argument about the changing role of retention and recruitment marketing. In many ways retention marketing has become one of the most effective recruitment methods. The concept of inbound marketing really refers to the process of attracting a customer to you (a recruitment strategy) but due to the nature of the marketing channels used for inbound marketing such as social media, blogging and search marketing it is now possible to build close, often 1 to 1 relationships with large numbers of your customers and potential customers and to then have these individuals then market your business to their social and business contacts (retention marketing operating as a recruitment tool). People do love to share content and experiences. Jonah Berger and Katherine L. Milkman of the Wharton Business School carried out a study called “Social Transmission, Emotion, and the Virality of Online Content” in 2010. If you want to learn about the psychology and social pressures that lead to the behaviour of sharing then this is a useful study to read. Sharing information is nothing new; people have always trusted personal recommendations more than advertising and this hasn’t changed. All that has changed is that it is now scalable to manage lots and lots of close relationships using tools such as Twitter, Linkedin and Facebook rather than telephone calls, written letters and face to face meetings. Human nature has not changed at all – we like to physically meet and converse with others so face to face meetings will always possibly be the best way to develop a relationship of any kind; a video call (e.g. on Skype) is now I would say secondary to this followed by a voice call. But Social media has a roll to play in sorting the wheat from the chaff. It is costly to start a potential business relationship with a 30 minute phone call or a 20 minute conversation at a networking event where it could be a quick conversation via a blog or social media site. Once initial interest has been determined through a short conversation on a social site then the relationship can be taken to the next level if the opportunity and potential value for both parties is there. Because of the emergence of these new communication channels it is now possible to scale the investment you make in your communications on an individual basis. There is a lot of hot air going on in social media and a lot of time being wasted but if you can over time quickly get a sense for who is serious and who is a time waster then you can develop your marketing strategy accordingly investing your time more and more efficiently. Now, going back to the whole retention being the new recruitment idea; Once you know who your best customers are and you know who they have the potential to connect you to – through looking at their social profiles on the social networks that they use then you can determine not only their value as an existing customer but also their potential value as an advocate for your business. Good customers who are also well connected should therefore receive a large amount of your attention as they have the best potential to help your business grow and at the same time you will be strengthening your existing relationship. This idea is fundamentally at odds with the frustrating marketing techniques of the mobile phone companies who reward new customers far more than they do existing customers. I can see why this has worked in the past but I cannot see this technique having a big future; they should be focusing more and more on rewarding loyalty.